Are you ready for this week's new CASology cue card? I stamped my focal image and sentiment on my card base but wanted to accent it with some patterned paper. I created a frame using two stitched mats. When you have a smaller focal image and/or sentiment using a frame grounds it so that your elements are not lost on the page. I can't wait to see what APPLE means to you! Oh I love that frame. So awesome! What an adorable card, Tracey. Love the frame! So pretty! Love the autumn feel of this! Bring it on! Love that stitched mat frame. I've got to try it! Great card this week Tracey! That paper is so cute! Love how you used it to frame your fun apple, Tracey! Fab card! The frame is perfect here Tracey! I haven't used this PTI apple in a while, need to ink it up! Sweet frame around this apple. I don't know if I have even one apple stamp...I will be hunting my stash today. Such a fun card. I love the frame that you created. This is fabulous. I never thought of using patterned paper that way, and I love the look. You are right in how it really makes your focal point stand out. So pretty! Love this cards colors! Super Love this Tracey! So CAS and perfect. Great teacher card! 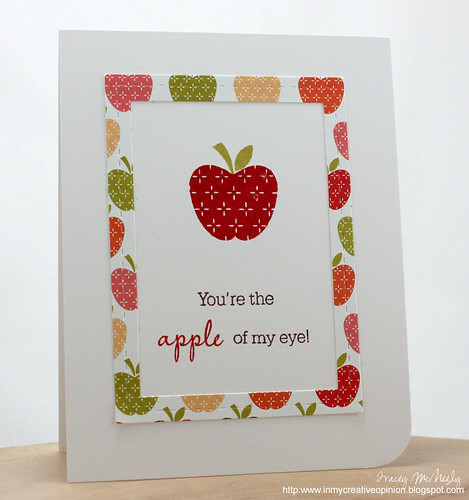 Love the apple frame ~ another fabulous idea to try. Love the patterned papers match perfectly! I really like the paper in the frame and how it matches the larger apple as the focal image! Beautiful card, well done! I love your colors and stamped frame. Your apple frame is perfect, Tracey. 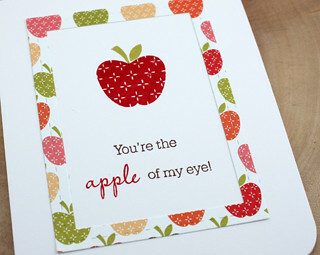 It really does make the centre apple and sentiment pop! Tracey, sorry I'm late to comment...I know you brought your son to college this week, and I have wanted to say hi and congrats and wow and I can't even imagine that day...hope you are doing OK! Anyway, I love your apple card, perfectly CAS and wonderfully arranged, as usual! so pretty! the embossed stitching is perfect!